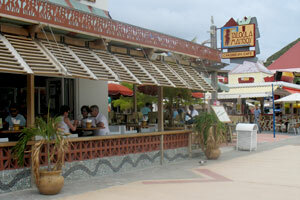 Taloula Mango's is located right on Great Bay Beach in Philipsburg Sint Maarten. What a lovely spot. Sit outside and see the Beach beyond through the breezy palms of the Boardwalk. What can be better than relaxing over a cool drink, soaking up the atmosphere in a really good Bar / Restaurant! So sit back, relax, breathe in those warming trade winds, and get some sand in your shoes! Great value food like Sandwiches, Seafood, Beef, Pasta, and a huge range of beers and spirits, Cocktails and Smoothies.